Just a quick report on my mini (whirlwind) tour to the UK. University of Cardiff. First stop was in Wales -- homeland of Katherine Zeta-Jones, I learned -- in the capitol city of Cardiff. There I gave a talk at the School of Psychology. The School is impressively large, taking up an entire multistory building, plus a few other bits of space. AND they've got an equally impressive brand new, within-school center for brain imaging, the Cardiff University Brain Research Imaging Centre (CUBRIC), which houses all the tools of the trade: fMRI, MEG, EEG, and TMS. I had a nice chat there with Derek Jones, who has been doing some very interesting DTI work on language-related fiber (or shall I say, fibre) pathways. E.g., check out Catani et al. (2005), Ann. Neurology, 2005 Jan;57(1):8-16. Keep your on eye of research coming out of this place in the near future! 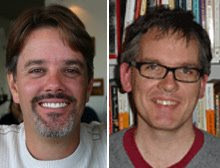 I spent most of my time, however, hanging out with Dylan Jones (pictured on right) and Bill Macken (pictured on left). These guys have been promoting, for some time now, the idea that Baddeley's phonological store, is neither phonological nor a much of a store (in the sense of a separate buffer or module). And they've got some pretty nice behavioral data to back it up. They suggest instead that, "A reformulation of short-term memory theory needs to embody (or indeed focus exclusively upon) perceptual and effector systems rather than bespoke storage modules" (Jones et al. 2007, Q J of Exp Psy 60:505-11). I completely agree, and have proposed a similar view (although without fancy words like "bespoke") on the basis of our fMRI findings. Have a look at anything authored by former TB West grad student, now D'Esposito/Berkeley post doc, Brad Buchsbaum, for details on our view. More importantly however, Dylan and Bill are very entertaining hosts. I highly recommend a visit! While in London, I also had a chance to have coffee with Celia Heyes and Caroline Catmur, who authored a recent paper on mirror neurons that I highlighted in a Scientific American blog. Celia has been studying imitation since long before the mirror neuron craze made it a hot topic, and has produced an impressive body of work. Caroline is a grad student working with Celia who is just finishing up an fMRI study related to their TMS-based mirror neuron paper. We had a nice discussion, and found that we essentially had the same views on the nature of the mirror system. I'm looking forward to seeing their fMRI paper in print! Oh, and if anyone is needs a good post doc, Caroline will be on the market soon! Thanks much to my hosts at both locales for a great trip!